Now the reality. Many states are blessed with year-round sunshine. We love this, but it doesn’t lend itself to the white Christmas dream. Unless you’re up in an Alaskan forest, snow isn’t always that pretty close-up either: after a couple of hours of cars, feet, and grit, it’s more like muddy slush than crisp white powder. This doesn’t stop us all dreaming of that perfect Christmas card scene. And there is nothing to stop you achieving that look! This holiday season, introduce an artificial flocked Christmas tree into your festive scheme. Designed to look like they’ve come straight from a snow-covered wilderness, flocked Christmas trees are artificial evergreens with an attractive sprinkling of fake snow. A flocked Christmas tree brings the charm of a traditional Christmas right into your home. Here’s the great advantage of artificial snow: you may not be able to build a snowman with it in the yard, but you can bring it indoors! There’s nothing as cosy as a snow-dusted tree in your living room. Just imagine the presents piled under it, the children beaming as they survey their gifts, the crackle of the fire in the hearth… It’s what Christmas dreams are made of. 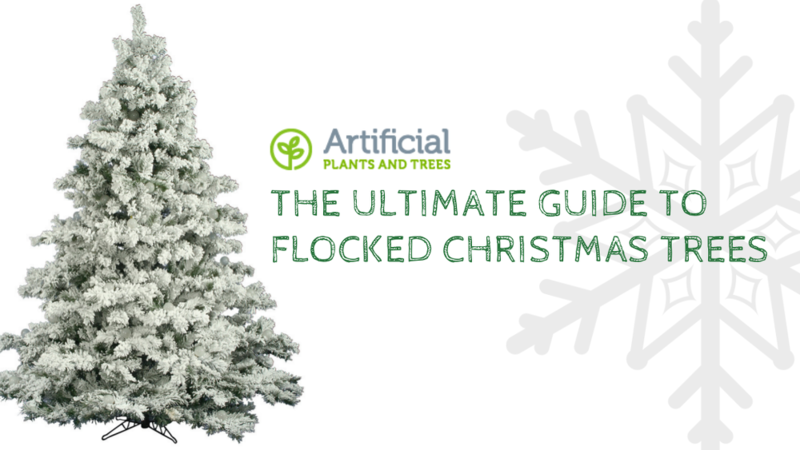 Here’s our guide to choosing the right flocked festive tree for you. A flocked Christmas tree instantly transforms a space into a winter wonderland. Whether you’re bringing some holiday cheer into your home, or creating Santa’s grotto for a display at work, the light dusting of snow really does give the tree that extra bit of festive magic. What is a flocked Christmas tree? Most artificial flocked Christmas trees are traditional evergreens with the addition of a sprinkling of snow. Some have the lightest dusting, while others look like they’ve come from a real wintry wilderness. Unlike natural trees, these beauties don’t shed needles, need minimum attention, and can be stored away after the holidays, ready for next year. The snow detail adds real seasonal charm – and unlike real snow, it can be used for indoor decoration. Flocked Christmas trees come in a whole forest of shapes and sizes, so it’s easy to find one that suits your space. You can choose a mighty ten foot evergreen to fill a double-height hallway, or use small potted trees to create stunning table top decorations. Many people choose six or seven foot trees for their living rooms: large enough to stand out, but not so enormous that they take over the space. Smaller flocked trees look romantic in bedrooms, or add some snowy fun to children’s rooms. This fairytale tree is perfect for a young girl’s bedroom. A super-size twelve foot flocked tree looks spectacular in a hotel lobby or in the entrance to a restaurant. 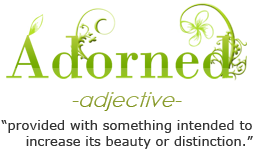 Go for a pre-lit design for a truly stunning result, which will draw people towards your business. 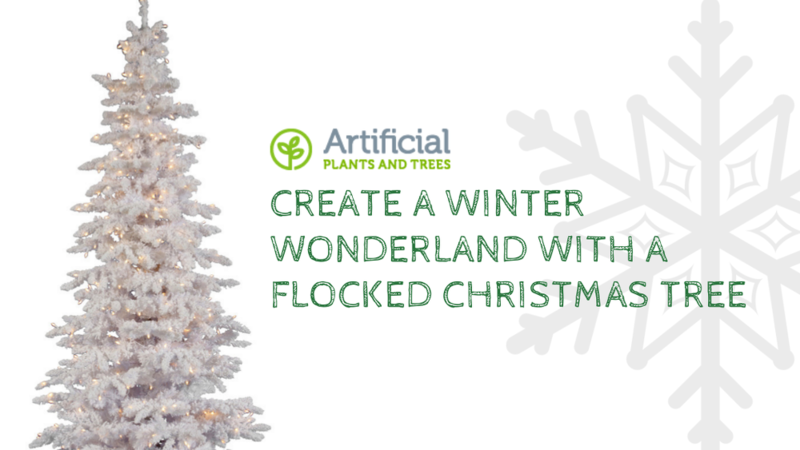 Flocked trees are perfect if you want to create a snow-themed shop display for the holiday. You can recreate that wonderful winter woodland look without having to use cans of messy snow spray or getting fake powder all over the place! If Santa’s visiting your store, treat him to a snowy tree or two for his grotto. Add some holiday cheer to your office or staff room with a lovely flocked Christmas tree. It doesn’t matter if you don’t have much space – one of the smaller potted varieties will sit neatly on a reception counter or small table, livening up the workplace for the festive season. Schools, colleges, hospitals, office buildings –anywhere, really! – will all benefit from this extra touch of holiday fun. Again, the pre-lit flock trees add their own special wintry magic, and need very little additional decoration. There are so many advantages to choosing an artificial Christmas tree, whether it’s for your home or for the workplace. There is no mess from dropped needles to have to vacuum up every day, and the branches won’t wilt or go brown. People often forget that a natural tree needs water or it’ll droop – it’s like cut flowers in that respect. An artificial Christmas tree can just be decorated, then at the end of the holiday season, you simply put it back in its box or Christmas tree bag, and store it safely in your attic or basement until next year. What are the particular advantages of going for a flocked artificial tree? It’s mainly an aesthetic choice. The pretty snowy decoration gives the tree quite a different finish to a natural plain green or shiny tinsel design. It doesn’t need much decorating to look good – if you go for a pre-lit version, you needn’t add anything at all if you don’t want to. However if you do want to go for it, colors can look amazing against the white of the artificial snow – like this gorgeous example. And of course, not forgetting that you can’t use real snow for indoor decoration, period! A tree that comes ready-decorated with artificial snow saves you from having to use snow spray or other messy methods of faking snow. You’ve decided that “White Christmas” is the theme for you this year. It’s a great look. So, it’s time to choose the tree. Flocked Christmas trees have become so popular that they’re now available in many shapes, sizes and styles. Which is the best for your home or workplace? Here’s our guide to what’s available. The majority of flocked Christmas trees are natural looking. By this, we mean they have realistic branches and needles, designed to replicate real evergreens. Flocked trees are intended to look like they’ve come straight from the winter woods, and so you can stick with this rustic, natural look. However, it’s Christmas, so don’t feel constrained by convention! There are also plenty of fabulous fashion styles to choose from. Retro white trees are back on-trend, and these give an extra snowy look. Search out white twig styles for a really elegant and romantic effect, or trees with sprinkles of glitter. Look for ultra fashionable upside down trees to make a real statement. And of course, there’s a great variety of pre-lit artificial flocked trees (more about these beautiful trees later). 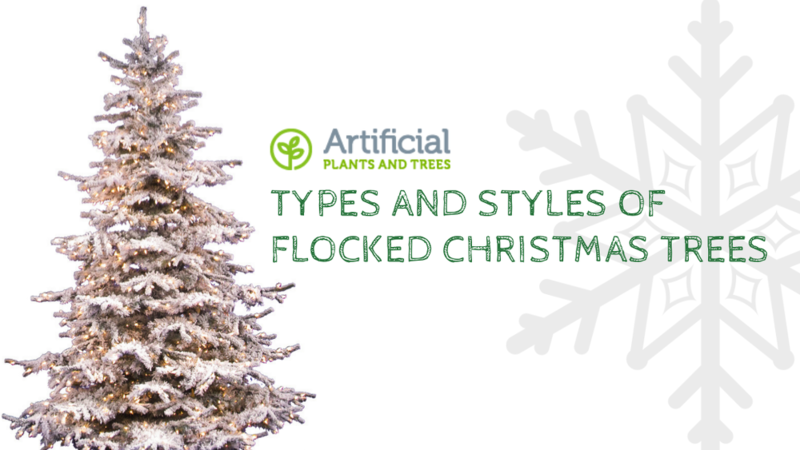 What varieties of artificial flocked trees are available? If you’re going for a realistic Christmas tree, you have a choice of varieties. This includes the “King of Evergreens”, the spruce, which has a slightly blue shade to its densely packed needles. This tree grows in colder climates, so it’s certainly at home under a coating of snow! The fir is always a popular Christmas tree choice, with a rich green hue and classic shape. You can also choose from a range of different pine trees, another winter favorite. Whichever variety you go for, you’re guaranteed a beautiful, realistic tree with no needle drop or imperfections. How snowy do you go? This is a really important factor when you’re considering a flocked tree: how much snow do you want on the branches? The Alaskan design, for example, has a lovely blanket of snow with very little green showing. Other varieties have just a light coating, adding a pretty touch of detail to the tree. Or you can go with a laser tree which is a thin coating of flocking with dazzling glitter to make your lights pop. Think about what you plan to use to trim the tree: delicate decorations may get lost in a highly flocked tree, but bright baubles look fabulous. Christmas lights also look quite different depending on how thick the coating of snow is. Do you want cones and berries? Some artificial trees come with extra details such as artificial pine cones and berries. These can form the basis of a rustic, naturalistic scheme, which is increasingly popular. Look out for flocked trees with both cones and lights, as these can be a complete, ready-to-go decoration. If you’re choosing a tree for a commercial space such as a hotel or theater lobby, or perhaps a high-ceilinged store or restaurant, artificial flocked trees will go as high as ten, twelve, or even fourteen feet tall. The artificial snow will make your tree stand out from the other trees in the mall. Some of these spectacular trees also come with lights, reducing the logistical difficulties of trimming at height. Of course, tall trees don’t just have to be for business use. If you are lucky enough to have a feature stairwell or a double-height space, you can really go for it this Christmas with a nine, ten, or even twelve feet tall tree. These stunning artificial trees will last you for years and they’ll soon pay for themselves, as the cost of a new natural tree each Christmas soon adds up. There are flocked Christmas trees to suit every size space in your home, so it’s easy to find one that looks just right. A Christmas tree for a large living room? Choose one that’s around seven or eight feet. A tree to stand on a table? A three or four feet tree will look perfect. A five or six foot tree is a versatile height that will work well in most homes, and these are very popular sizes. It’s always worth measuring a space properly before committing to your tree: for example, if a seven and a half foot tree touches the ceiling, you’re better off dropping down slightly to a six foot tree. Not only will it look better, but it gives you more scope for a tree topper. Artificial tree measurements always include the stand, so measure your space from the ground up. Think about the density and circumference of your tree as well as the height (we’ll come onto super-slim pencil trees shortly). Can you still maneuver around the room without brushing into it all the time? If it’s for a public place, will it be in anybody’s way? If you’re expecting Santa to call, is there enough space underneath the tree for all those exciting presents? Wherever your tree stands, that extra-special flocked finish will make it a real eye-catching center piece. If space is tight, an elegant pencil Christmas tree is the way to go. A modest space doesn’t mean you have to choose a micro-sized table top tree. It’s rare that a room doesn’t have the headroom for a six or seven foot tree: it’s the spread of the branches that’s the issue in limited space. If you live in an apartment or need to squeeze a tree into a narrow gap, try a pencil tree. They are also great in stores and restaurants, where you don’t want customers cannoning off the Christmas decorations as they move about. We love this neat, space-saving solution. Like the standard-spread trees, the artificial pencil trees come in a range of finishes, including flocked varieties. The lovely, fresh white of the snow effect brightens up any space, and look out for funky contemporary lime and white varieties. Pencil Christmas trees are available unlit or pre-lit, and some have glittery finishes for extra festive bling. If you want a really modern look, search out pole pine trees, which look particularly good as a pair to flank doorways, steps, and stairs. Flocked pencil trees go right up to a towering nine and a half feet: perfect for stairways. Table top Christmas trees are such a delight. They can make truly stunning dinner table center pieces, or be used to add holiday cheer to bedrooms (especially children’s bedrooms) and hallways. Less is definitely more when it comes to these charming little trees! Presented in pretty pots or rustic burlap bases, some pre-lit, they are the perfect complete holiday decoration. If you’re struggling with decorative ideas for your festive dining table, simply place a potted flocked tree in the center, and voila – an easy, and absolutely stunning decoration for the Christmas feast. The smallest flocked table top trees are just twelve inches tall. These are wonderful for making nativity or winter scenes, or simply to cheer up your desk at work! A two or three feet tree in an attractive pot is a lovely ready-made decoration for a counter or reception desk, and the flocked effect makes them stand out from the conventional artificial trees. They also make popular holiday gifts, as they are so beautifully presented. 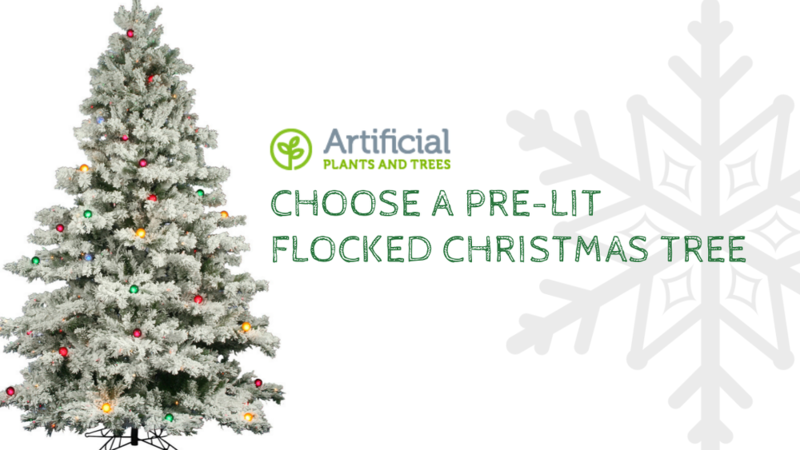 With flocked artificial trees, you get the choice between unlit and pre-lit varieties. Both types have their advantages; and in the end, it’s simply down to personal choice whether you want a ready-lit tree, prefer to add your favorite lights yourself, or decide to go for a more natural finish. Here are a few things you may like to think about before deciding which type to buy. Getting all the Christmas lights evenly spaced on the tree without ending up in a tangle is one of the trickiest tasks of the holidays! If you choose an artificial tree that’s already trimmed with twinkling lights, you save yourself a lot of hassle. After all, there’s rather a lot to do at this time of year, so anything time-saving is a great idea. That’s the practical argument for choosing a pre-lit tree. However, for many of us, the main advantage of a pre-lit flocked tree is the beautiful effect of the lights. Different types of lights create very different moods. The combination of soft, snowy boughs and warmer-toned lights gives a gentle, glowing result, which looks cosily inviting in your home. Sharper, brighter LED lights on a cool white tree are reminiscent of a glittering frost, and appear truly magical. Multi-colored lights shining through the snow-covered branches create a fairytale feel. We’re certainly presenting you with a lot of choices here! However that’s what choosing an artificial Christmas tree is all about: finding the one that’s just right for you. If you decide to go for a pre-lit flocked tree, there are several different types of light to consider, as we’ve already mentioned. Ask yourself what kind of light you like. Do you favor a soft and warm glow, or do you like the contemporary sparkle of clear or LED lights? Do you want white, warm, or multi-colored? A few lights scattered at strategic intervals, or a galaxy of twinkling lights on every bough? Still or static, or options for both? Battery or mains? We’re sorry to bombard you with options! Simply narrow down the size and style of tree you want to a manageable shortlist, then investigate the lighting options. We have such a large selection that it’s super-easy to tick all the boxes and find the perfect tree. Why choose a non-lit variety? Of course, you may have a more natural-looking decorative scheme in mind. The beauty of the realistic-looking firs or pines with their frosting of snow can be enough without much extra embellishment. Quite often, people will choose to light their Christmas tree to brighten up a dull corner of a room. The whiteness of the fake snow on our flocked trees adds a gentle glow on its own, so the need for lighting isn’t actually as great. It also may be that you already have a great set of lights that are ready to be hung on the tree. An advantage of adding lights on separately is that you can easily change your color scheme each year, and decorate your flocked tree with new lights every time. Have we convinced you that the forest-fresh look of a quality flocked tree is the way forward? We think that our frosted trees look incredible, bringing a special touch of festive magic into your home or business. A flocked tree is incredibly versatile to decorate: scroll through these design ideas for some inspiration, and see how you can change the look of your flocked tree each Christmas. Whichever state you live in, a winter wonderland is not out of reach, and you can create your own snowy glade in your living room or shop display. Even if your native plants are more succulents than spruces, there’s no reason at all why you can’t go for the traditional Christmas card look when it comes to designing your tree. And of course, you’re also getting all the other advantages of an artificial Christmas tree – low maintenance, no imperfections, no messy needle drops or drooping branches. Yes, you have the initial cost, but you don’t have to pay for a new natural tree year after year, or go through the hassle of choosing it, getting it home intact, and then disposing of it in the New Year. In some parts of the States, it’s really hard to find a decent quality real tree at all. With a great selection of sizes, varieties, colors, and lighting, you’re sure to find the right flocked Christmas tree for you. 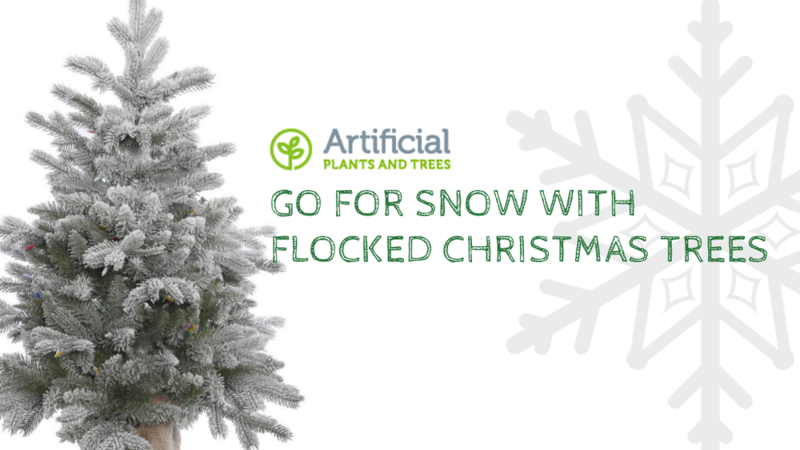 And because our quality artificial flock trees will last for years, all your Christmases will definitely be white. If you’d like some assistance in choosing the right flocked Christmas tree for your home or business, please contact us online or call us on 1.888.532.0232. We’re here to advise you and guide you on everything from pine cones to shipping times. Like Santa’s elves, we’ll help you get the tree of your dreams, package it up safely, then make sure it arrives with you in time for the day itself.